This morning I woke up, and someone who definitely has influenced my life, didn’t. Anthony Bourdain. For as long as I can remember, I have religiously watched him grow as he has become a celebrity around the world, sat with presidents, met with extremists, eaten crazy food, and most of all, humanized people around the world. Sure, I didn’t always agree with all of his politics, especially when it came to Israel, but in so many other was I admired his strength to be able to tell peoples stories in some of the most complicated places in the world that are unreachable to most people. Bourdain made travel look cool even in the most dangerous countries, with his Persol sunglasses and his casual demeanor, anywhere he went, it seemed as though he made fast friends with the locals and talked to them about topics that most people would deem scary or too taboo to talk about, as he said, “I’m not afraid to look like an idiot.” Although there were many times where maybe he didn’t quite look like an idiot, but maybe a little bit out of place or uncomfortable, it was clear that he didn’t care and was just asking out of curiosity of what it’s like to be in that particular situation and because of his ability to just not care about how he looked, in the end, it helped all of us to better understand the greater situation of where ever he was visiting. On one of his shows, he talks about his love for the hot dogs at Papaya and when I lived in New York, I remember visiting Papaya Dog on 86th street and thinking to myself that I hope I run into Anthony Bourdain while I’m here! Those of you who know me know that I don’t really fan girl very often and there are very few people who I will go to great lengths to to meet them. However Anthony Bourdain was one of the people who I was determined to meet. 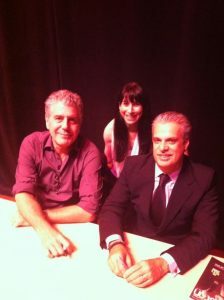 When I moved back from NYC and lived in Houston for a few years, Bourdain and Eric Ripert were speaking at a theater in Houston. I rarely buy tickets to shows, but this was an exception and the day that the tickets went on sale, I made sure that I had a seat. As I sat there by myself, I remember listening to him and being in awe of him talking about all of his cooking and traveling adventures. One of the things that I remember, and I NEVER remember small details like this, was when someone from the audience asked him, “So when someone hands you a very scary looking meal, what do you do? Do you always eat it?” As he was casually walking through the audience, his response was, “When I was growing up, my grandmother always told me that I had to finish my food or else I couldn’t leave the table. So I have applied that mentality to every meal that I have eaten. If someone is taking the time to cook a meal and host me, then the least I can do is finish my plate out of respect.” He also mentioned that the only food he really won’t eat is cat and dog. Later that evening, as a typical fan girl would do, I stood at the back stage door waiting for him to come out so that he could sign my book. I started chatting with the crew, and apparently he was doing a VIP reception, which at $2000 per ticket, I definitely couldn’t afford to get into. After doing a little bit of flirting, the stage crew told me that I could go in and meet him and have some food. It was definitely an unforgettable night for me! While we didn’t have a super in depth conversation, because honestly I was sweating and so nervous to meet him, I told him how much I loved his books and how much I love his show and hearing about his travel adventures. He said, “Thank you so much, what is your name?” I said, “Casie.” As he signed my book and I had a huge grin on my face from ear to ear. Anthony Bourdain was a little crazy, but also SO cool. He was also bold, daring, adventurous, hard, thoughtful, inquisitive, a storyteller, and most of all frank. Sometimes I think I had a little crush on him, because he was doing what I wanted to do! OK maybe I didn’t exactly want to be eating cockroaches on a stick, but he was clearly living life to the fullest and I admired that. He always talked frankly about his struggles with drugs and alcohol, but for whatever reason, it seemed as though he was OK with it and he just wanted to enjoy life in his own way (and I’m not condoning these actions). I think I have watched every episode of his show,and to this day I still follow his Instagram stories, and whether it was showing us his hotel room in Korea with hard punk music playing in the background, or just showing the view from his NYC apartment while he was smoking a joint, his life always seemed fascinating to me. One of the things I admired most about Bourdain aside from his ability to just be himself, was that he was SO adventurous and willingness to try new things. As he said, “Without experimentation, a willingness to ask questions and try new things, we shall surely become static, repetitive, and moribund.” I try to live my life just like this, every single day. On his last episode of his TV show No Reservations, before he switched networks, I sat and watched as he said this quote I remember writing it down because of how much is resonated with me. And so I did and will keep doing for the rest of my life. Thank you Anthony Bourdain, for your insight on the world around us, for sitting down and having those difficult conversations, and letting us into places that most of us will never be able to travel to, and most of all, thank you for just being your authentically cool you. If you are suffering from suicidal thoughts you aren’t alone and you can get help. Call: 800.273.8255 OR call me… I’m here for you to listen, talk, whatever you need.